What is the gain of a microphone? The gain of a microphone sets the sensitivity of the audio input. When setting the gain you increase or decrease the strength of a recorded audio signal in order to optimise it for further signal processing. If you have a very silent or weak input signal you'll want to set a higher gain to get a better signal-to-noise ratio for your recording. Otherwise the low signal can lead to an unwanted noise in your recording. If you have a very loud input signal you need to lower the gain. Otherwise the signal fed into the Analog Digital Converter (ADC) will be too loud. This leads to an overdrive and distorted sound. 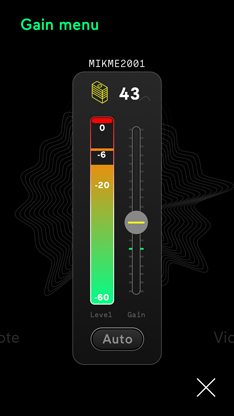 App: An exclamation mark next to the gain menu icon, red parts in your audio wave form and a red bar in the VU meter of your audio level. Microphone: You can’t hear anything or need to increase the volume when monitoring the audio signal with your headphones. How do I set the gain of my Mikme Microphone? Since the latest App (version 3.1) and firmware (version 70.03) release we’ve added an automatic gain. 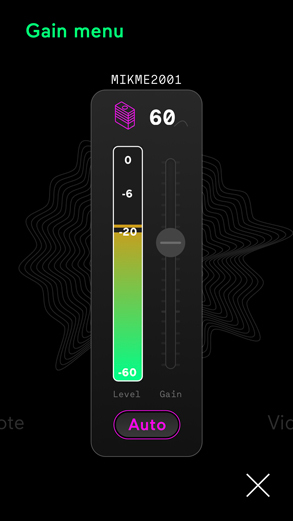 The Auto Gain levels the audio input for you before and while a recording in order to prevent and reduce the amount of recordings with distortion or noise. Choose your favourite way how to set and adjust the gain. Please Note. The Auto Gain is automatically active after a successful software update to version 70.03 (Mikme OS) and 3.1 (Mikme App). You do not have to set the Gain or activate the Auto Gain. It's active for every recording whether you use the Mikme standalone, wirelessly with the Mikme App or via USB. If Auto Gain is active, start recording and Auto gain will automatically set the gain while recording. There is nothing further to do. If you want to change the gain from/to Auto gain from the Mikme Microphone access the gain mode. Press and hold the top capture button for at least 1 second. TOP LED is pink = Auto Gain is active. TOP LED is yellow = Manual Gain is active. Double tap the TOP button to switch between and activate Auto and Manual Gain. The auto gain will try to set an optimal gain for you. You always have the option to set and adjust the gain according to your wishes. You do so by pushing the ➕/➖ buttons on the rear side of the Mikme Microphone. You can set the gain from 0-30 dB. Make sure there is no irregular flashing of the top LED when editing the gain as this indicates a signal overload (= distorted sound). Once you’ve finished, push the top button again. It will light up in the color of your previous recording mode: white (used standalone) or blue (connected to app) or turquoise (connected as USB microphone). Once you set the Auto gain active it will be always set the gain automatically whether you record locally, wirelessly or via USB. You do not have to access the gain mode before each recording. Just start recording and Auto gain will set the gain automatically while you record. Within the first 5 seconds after starting a recording or after accessing the gain mode (on the Microphone) the Auto gain algorithm adjusts the gain very aggressively and quickly according the current sound level. After that Auto gain goes back to "default" mode where it changes the gain slower and subtle. Reduces gain instantly when clipping (audio level too high) and increases gain instantly on low audio level. Reduces gain instantly when clipping (audio level too high) and increases gain slowly after 20 seconds of too low audio level. If Auto Gain is active, start recording and Auto gain will automatically set the gain while recording. There is nothing further to do. If you want to change the gain from/to Auto gain from the Mikme App access the gain mode in the app. The “Auto” button lights pink when "Auto Gain" mode is active. Simply tap the button to switch between Manual and Auto Gain. A VU (Volume Unit) meter shows the audio level. A traffic light system indicates the level balance. The gain slider next to the VU meter (greyed out for auto mode) can be moved if you wish to increase or decrease the gain by yourself. You’ll see the number above changing with it. When there was a too loud input signal you’ll see a little red bar that indicates there was a distortion. When you’ve fixed the setting, simply tab on the level VU meter and the red bar disappears. By tapping ✖️ you exit the gain menu and you'll be back to where you entered the gain menu. The Mikme Microphone will save the gain settings which are also used if you use the Mikme Microphone in standalone or USB mode. Once you set the Auto gain active it will be always set the gain automatically whether you record locally, wirelessly or via USB. You do not have to access the gain setting before each recording. In aggressive mode (First 5 seconds): Reduces gain instantly when clipping (audio level too high) and increases gain instantly on low audio level. On default mode (after 5 seconds): Reduces gain instantly when clipping (audio level too high) and increases gain slowly after 20 seconds of too low audio level. You also can set the gain manually to a fixed value. If you set the gain manually it will NOT automatically change while recording. We recommend performing a sound check and setting the gain before a recording. Make the soundcheck by accessing the gain menu and setting the gain accordingly. Press and hold the top capture button for at least 1 second till the top LED shines yellow. Double tap the TOP button to switch between Auto and Manual Gain. Set and adjust the gain by pushing the ➕/➖ buttons on the rear side of the Mikme Microphone while you’re checking/recording sound. The gain is set properly when there is no irregular flashing of the top LED anymore while you’re speaking, singing etc. An irregular flashing indicates a signal overload (= distorted sound) and requires to lower the gain with the ➖ button. You can set the gain from 0-30 dB. The gain is now saved for future recordings, even if you switch off the Mikme Microphone. When the top LED flashes irregularly you need to check and reduce the current gain setting. If you already set the lowest possible gain, you can increase the distance to the sound source to reduce the signal level of the microphone's input. If Manual Gain is active you can change the gain manually while you record by pushing the ➕/➖ buttons on the rear side of the Mikme Microphone. The gain is set properly when there is no irregular flashing of the top LED anymore while you’re speaking, singing etc. After you set the gain manually it will be stored and used for your next recordings too. You also can change the gain while recording from the App with the gain settings menu where you also see the VU meter to check the audio level of your recording. The “Auto” button is greyed out when "Manual Gain" mode is active. Simply tap the button to switch between Auto and Manual Gain. A VU (Volume Unit) meter shows the audio level. A traffic light system shows the balance of the level. Move the slider on the right to manually adjust the gain. You’ll see the number above changes with it. When there was a too loud signal, you’ll see a little red bar that indicates there was a distortion. This means you need to decrease the gain by moving down the slider. Decrease until you're back in green area of the level meter. Additionally, you can check your Mikme Microphone. If there is still an irregular flashing of the top LED you sill have a signal overload and need to lower the gain. Once you’ve adjusted the gain according to your audio input you can tab on the VU meter and the red bar disappears. By tapping✖️you exit the gain menu and you'll be back to where you entered the gain menu. If Manual Gain is active you can change the gain manually while you record by pushing the ➕/➖ buttons on the rear side of the Mikme Microphone or opening the gain settings from the app. How to set the gain with Mikme OS 0.54 and lower. Now you are ready to capture audio in finest quality.